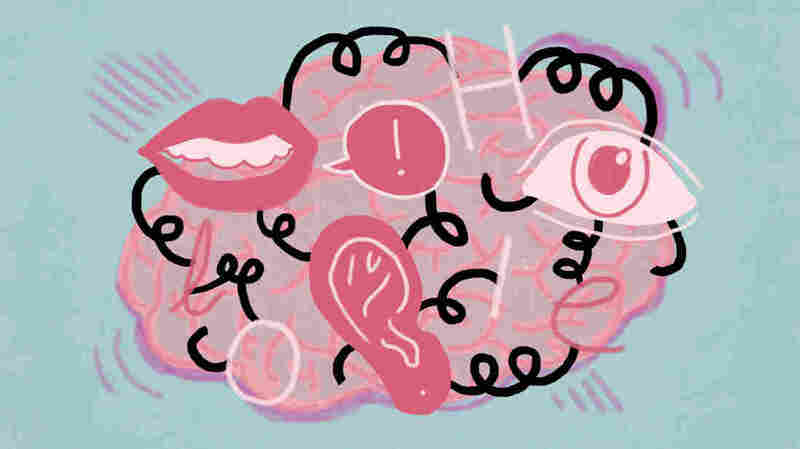 How Science Is Rewiring The Dyslexic Brain : NPR Ed Scientists are exploring how human brains learn to read — and discovering new ways that brains with dyslexia can learn to cope. Part 2 of our series "Unlocking Dyslexia." Our ancient ancestors were able to speak long before they were able to read or write. That history is etched in our brains. The human brain naturally picks up spoken language. Not so for reading. 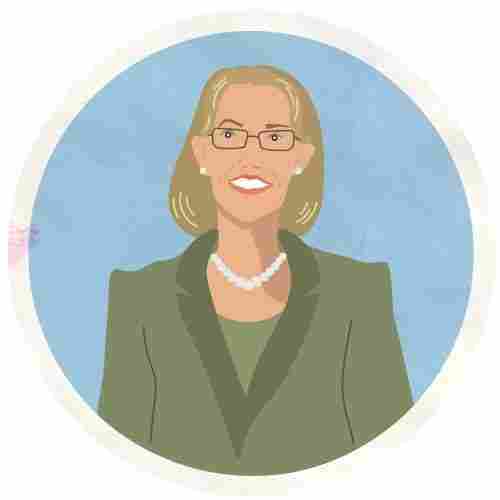 "You can think of the reading brain as moonlighting," says Guinevere Eden, director of Georgetown University's Center for the Study of Learning. "Your brain will essentially take other brain areas — that were designed to do something else — and use [them] toward reading." Learning to read requires co-opting parts of the brain and training them to recognize letters, clump those letters together into small units, relate those units to sounds and, eventually, blend those sounds together into a word. For millions of people with dyslexia — the most common learning disability in the U.S. — that process doesn't come easily. In the basement of a medical building in Washington, D.C., Eden and her team of researchers are using brain scans to figure out exactly what makes dyslexic brains different. They also want to know what can be done to rewire the brain, coaxing it to do what it wasn't "designed" to do. Surrounded by computers in the control room on a Saturday morning, Eden is focused on 8-year-old Tiffany Hilton. "They are taking pictures of my brain, so they can see how big or small it is," Tiffany explains. She has dyslexia and is participating in Eden's research. With a sheepish little smile, Tiffany adds: "My brain is big!" Eden ushers Tiffany into the next room, where a technician helps her lie flat on her back inside a big cylindrical fMRI machine. And, just like Tiffany said, they are taking pictures of her brain. But they aren't interested in the size. Instead, the researchers want to watch as Tiffany performs a series of short tasks — things like quickly deciding whether a word has a tall letter in it. From the windowless control room, Eden monitors several computers with images displaying which parts of Tiffany's brain are most active during the tasks. For this study, Eden is particularly focused on two areas on the left side of the brain that are key for reading. 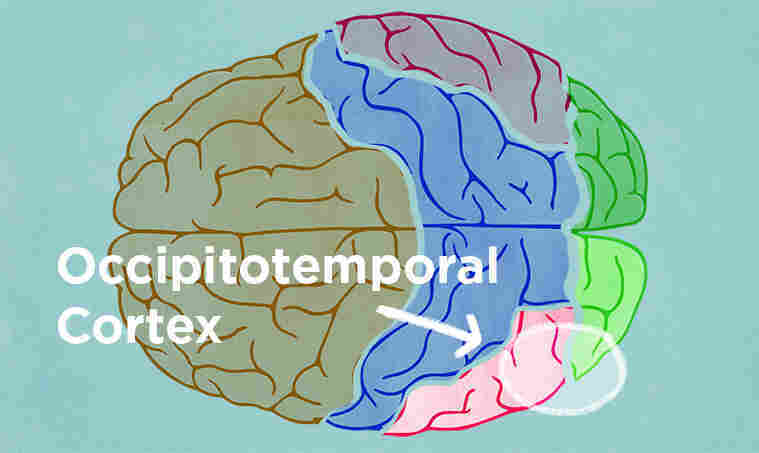 The first is in the left temporoparietal cortex. It is traditionally used to process spoken language. When learning to read, we start using it to sound out words. "Then after you've done that a few times," Eden explains, "you begin to say, 'Well, hang on, I've done this one before.' And it seems that your visual system recognizes it by sight." That's when things move over to a second area of the brain involved in reading: the occipitotemporal cortex, which is part of the visual processing center. It's at the base of the brain, behind our ears. A person who never learned to read uses this part of the brain to recognize objects — like a toaster or a chair. But, as we become fluent readers, we train this brain area to recognize letters and words visually. These words are called sight words: any word that you can see and instantly know without thinking about the letters and sounds. This requires retraining the brain. When recognizing a chair, the brain naturally sees it from many different angles — left, right, up, down — and, regardless of the perspective, the brain knows it is a chair. But that doesn't work for letters. Look at a lowercase 'b' from the backside of the page, and it looks like a lowercase 'd.' They are the same basic shape and, yet, two totally different letters. But, as it does with a chair, the brain wants to recognize them as the same object. Everyone — not just people with dyslexia — has to teach the brain not to conflate 'b' and 'd'. So, what is happening in a dyslexic brain? "Both areas are under-activated in dyslexia," says Eden. Looking at images of those two brain areas — the one involved in sounding out words and the one involved in visually recognizing words — scientists see that they don't light up quite as much as they do for a typical reader. This under-activation in dyslexia is not associated with low intelligence or poor education, but it does mean that people with dyslexia have difficulty sounding out words. Knowing this, Eden decided to try something: She asked people with dyslexia to participate in a six-week research intervention. Five days a week, for six hours a day, the subjects work in a classroom with a tutor. They do reading exercises as well as letter and number manipulations. This is how Tiffany spent her summer. In a small school off a busy street in Northern Virginia, she'd sit at a low table across from her tutor. Around them were piles of flash cards and laminated sheets. "Take a picture of the word MEAL," Tiffany's tutor said one afternoon as they neared the end of that day's six-hour session. The tutor was holding up a flash card with the word M-E-A-L printed on it, waiting for Tiffany to take a mental picture of the bold letters. Covering the card, the tutor gave Tiffany a puzzle: "If I erase the 'A' in that word, what word would we see?" "Erase the 'A'? Can I see it again?" Tiffany said, contorting her face in concentration. Then, she ventured a guess: "It would be MEAL? No! It would be MAAL." With a little bit of help, she figured it out: "It would be MEL! " This type of manipulation is very hard for people with dyslexia. But over the course of the six weeks, the research subjects practice — a lot. And the researchers can tell. Eden and her team take brain scans of all the research participants before and after the intervention. Studying the images, they find that at the end of the six weeks, the brain areas typically associated with reading, in the left hemisphere, have indeed become more active. But something else happens, too. "Other areas became more active," Eden explains with subtle excitement. "And they're not areas you think of as being involved in reading: They were in the right hemisphere." New areas of the brain start lighting up and helping out with the reading process. Eden says this is similar to what scientists see in stroke victims, where other parts of the brain start compensating. Eden has already done a study like this in adults. Now, she's studying Tiffany and 47 other kids over the course of five years. If her earlier findings hold up, she says, the would suggest that children with dyslexia should get intensive reading tutoring. Those lessons, she says hopefully, can change how the brain reads.